The world is divided between those who have seen the Taj and those who have not. Very soon, I hope to be on the side that has seen the Taj." 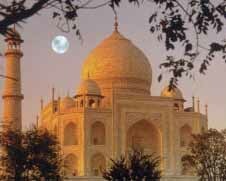 Words said by William Jefferson Clinton President, United States of America while addressing the Indian Parliament on 22.03.2000 rightly defining the immense architectural and emotional significance the Taj Mahal has, in the hearts of people around the world. Taj Mahal : Agra is famous as being home to one of the seven wonders of the world-the Taj Mahal. The architectural splendour of the mausoleums, the fort and the palaces is a vivid remainder of the mausoleums, the fort and the palaces is a vivid reminder of the capital in the 16th and early 17th centuries. Agra Fort : Built by the great Emperor Akbar in 1565 A.D. the fort is a masterpiece of design and construction. 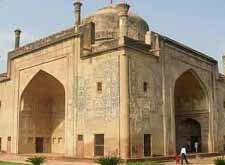 Within the fort are a number of exquisite building, including the Moti Masjid, Diwane-I-Aam, Diwani-I-Khas and musanman Burj, where the Emperor Shah Jahan died in imprisonment beside Jahangirs place, Khaas Mahal and the Sheesh Mahal. Itmad - Ud Daula : To the north of the fort and across the river Yamuna are several fine examples of Mughal architecture. The Itmad -Ud -Daula as a by the Empress Noor Jehan as a memorial to her father Mirza Ghiyas Beg , is beautifully ornamented with pietra dura inlay and lattice work marble screens. Chini Ka Roza : The tomb of Afzal Khan, the persian poet and minister at Shah Jehan's court gets its name from the brightly coloured glazed tiles that decorate it . Lies just 1km beyond itmad -ud -daula. Sikandara : Welcome to Sikandra, a suburb of Agra, only 13 km. From the Agra Fort. The last resting place of the Mughal Emperor Akbar. Akbar was the greatest of the Mughal emperors and one of the most secular minded royalties of his time. He was the heir to a long tradition of oriental refinement, a great patron of the arts, literature, philosophy and science. 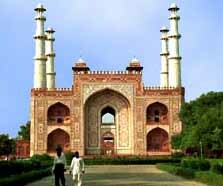 A visit to Akbar's monument opens before one, the completeness of Akbar's personality as completely as the Taj Mahal does of Mumtaz Mahal's. Fatehpur Sikri : Imposing gateways and light- hearted palaces were built in red sandstone within this fortified city only to be abandoned a few years later. Among its many architectural game are the places for his queens - Jodha Bai, Mariyam and his Turkish sultana, built in varying styles, each perfect in itself. The Diwan-e-Khas entirely unique in its concept is a tall vaulted room with an intricately carved central pillar and capital supporting a platform that once held the emperor's throne. Narrow galleries link this to the corners of the room where it is believed his ministers sat The airy panch mahal a 5 storied structure rising in pyramidal fashion was probably used by the ladies of the court. Set like a jewel in a courtyard of pink sandstone is the finest building here, the marble tomb of Salim Chisti enclosed by finely carved, lacy marble screens. The Buland Darwaza, an imposing gateway 54 m high was built to commemorate Akbar's Aligarh the famous university town is a center of Islamic studies. The city is also noted for its handicrafts and metal ware.